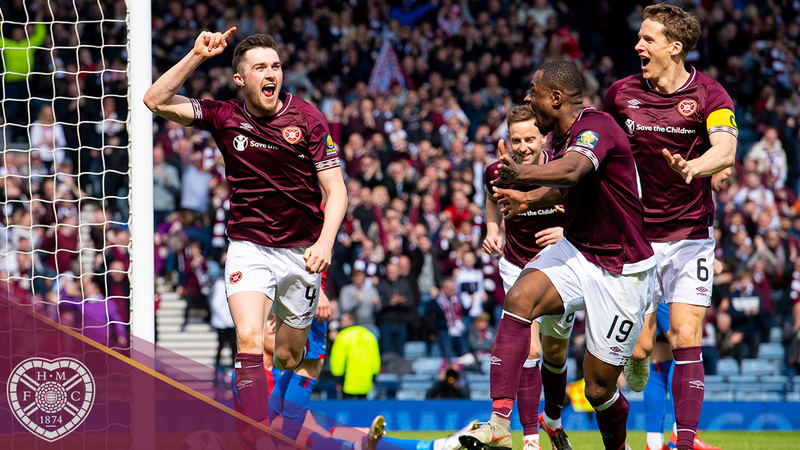 Hearts booked their place in the William Hill Scottish Cup Final with an emphatic win over Inverness Caledonian Thistle today at Hampden Park. After a closely-contested first half the Jam Tarts remerged firing on all cylinders, outclassing the Championship side. 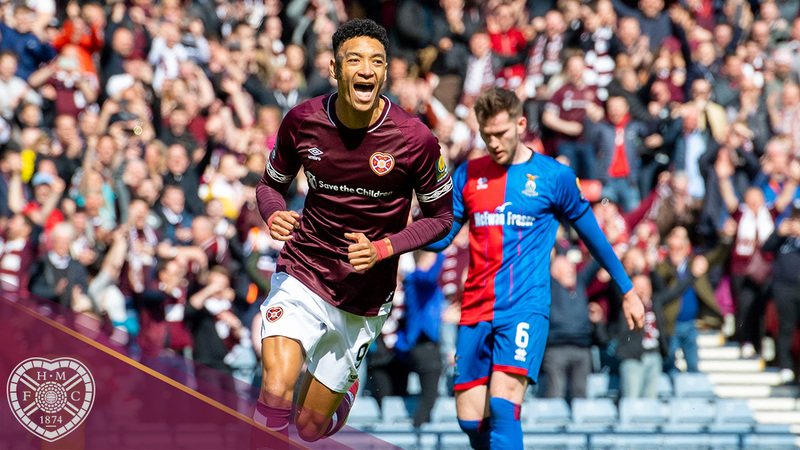 Uche Ikpeazu gave the Jambos the lead three minutes into the second half, before John Souttar volleyed home from a corner and substitute Sean Clare scored from the penalty spot to add gloss on the win. 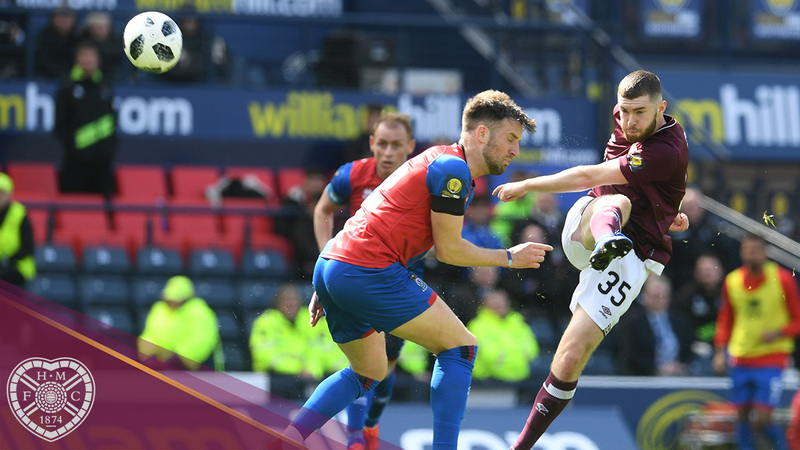 Manager Craig Levein made one change from the side that faced Hibs last week, with Sean Clare dropping to the bench as teenage forward Aidan Keena started up front in a more orthodox 4-4-2 formation. 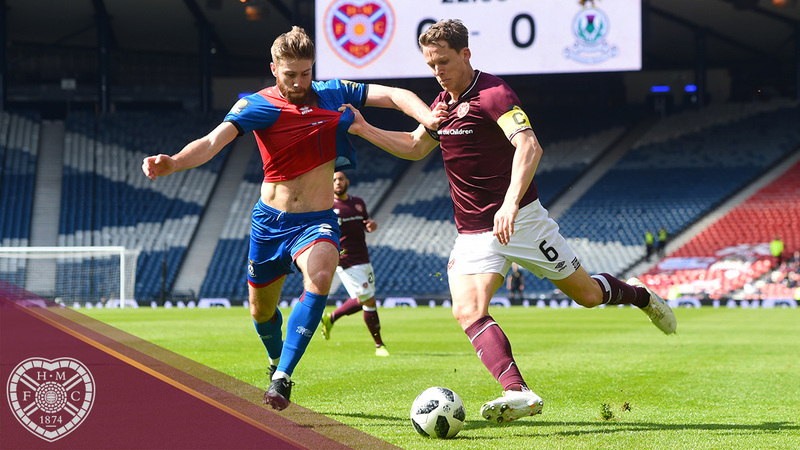 Hearts had the first chance of the match when Christophe Berra had a shot that flashed across the face of goal and was deflected over following a flurry of corners, and from that resulting corner, Michael Smith fired wide from distance. Ikpeazu then broke through on goal when a pass deflected over the top of the Inverness defence but, despite holding off the Caley backline using his trademark strength, the towering forward shot straight at Mark Ridgers when a pass was perhaps the better option. Into the second half, and Hearts started extremely brightly and at a higher tempo. Olly Lee came close to opening the scoring when he found space 30 yards from goal, and with typical accuracy, his shot flew towards the top corner before being tipped over by Ridgers. After more pressure, and corners, the wave of attacking paid off when the ball was played short to Jake Mulraney who beat his man and skipped to the byline before firing across goal where the ball was hammered in by Ikpeazu to break the deadlock. Hearts could smell blood now, and Berra nearly doubled the lead when he met Lee’s free kick but headed wide. However, they were nearly stung by an Inverness counter. After a foul, Joe Chalmers hit a superb free kick that Bobby Zlamal superbly tipped onto the bar. The Hearts pressure didn’t let up after this scare, and the lead was doubled when another set piece undid Inverness. Lee’s corner was flicked on at the near post and John Souttar came steaming in at the back post to grab a deserved second. The impressive Mulraney nearly setup a third, when his dazzling wing play baffled Shaun Rooney again, but Ikpeazu could only volley over his cross. Ikpeazu then won a penalty when Lee chipped it through to him, and he drew Ridgers into fouling him. Clare, a sub for Mulraney, stepped up and coolly converted his penalty, sending Ridgers the wrong way from the spot to seal the result. Oliver Bozanic nearly added a fourth late on but his curling effort went just over the bar as time ran down. Hearts now return to Hampden on May 25th for the showpiece event of the season, where they will take on the winners of tomorrow’s Aberdeen vs Celtic semi-final. Hearts: Zlamal, Smith, Souttar, Haring, Berra, Lee, Djoum (Bozanic, 76'), Ikpeazu, Mulraney (Clare, 70'), Burns, Keena (MacLean, 64'). Subs: Doyle, Shaughnessy, Wighton, Brandon. Inverness CT: Ridgers, Rooney, Tremarco (McHattie, 58'), Chalmers, McCart, Polworth, Doran, Walsh, White (McCauley, 83'), McKay, Trafford (Austin, 75'). Subs: Mackay, MacGregor, Brown, Harper.